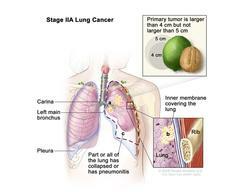 Two-panel drawing of stage IIA non-small cell lung cancer. First panel shows cancer (5 cm or less), and cancer in the right main bronchus and lymph nodes; also shown are the trachea, bronchioles, and diaphragm. Second panel shows cancer (more than 5 cm but not more than 7 cm), and cancer in the left main bronchus; also shown are the trachea, lymph nodes, bronchioles, and diaphragm. Insets show cancer that has spread from the lung into the innermost layer of the lung lining; a rib is also shown.